New Manufacture MK17S SCAR-H Aluminum Billet Lower. Mil-Spec Hard coat anodized (available in black only right now). 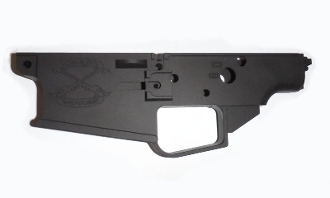 Compatible with PMAG 20 LR308 Magazines and similar SR25 Magazines. Maintain magazine commonality with your .308 AR platforms. Factory Parts install with no modifications. No internals or magazines are included with this item. NO FFL Required. The Upper on the SCAR-H is the serial numbered part, the lower is a replaceable component that can be shipped directly to you. The weight difference is negligible at a net 0.14 pounds. Until you consider carrying p-mags saves 0.17 pounds per magazine. If you carry more than one spare mag, the advantage goes to Pmags.